Beth Hagenauer from Dryden has defined supercruise as an ability to fly supersonically without using afterburner; USAF Flight Test Center at Edward Air Force Base defines supersonic speeds as being above Mach 1, without regard for transonic region (which is different for all aircraft – F-16s transonic region is from Mach 0,9 to Mach 1,1, and Gripen’s is even narrower). According to this definition, list of supercruisers is quite long. English Electric Lightning prototype exceeded Mach 1 on dry thrust on August 11, 1954, and could achieve Mach 1,22 without reheat. Term “supercruise” was actually first applied to the Lightning. Mirage IIIO with Avon engine was able to reach Mach 1,3 in 1962. F-104 Starflighter was capable of maintaining Mach 1,1 in level flight in military power, and in fact could maintain it for 15 minutes. 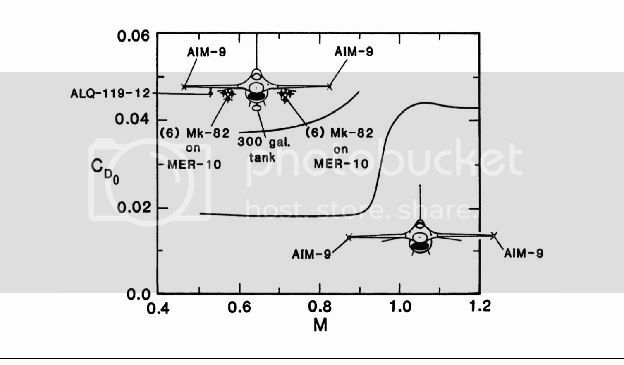 A clean F-16 (that is, no external stores except two missiles at wingtip stations) can cruise at Mach 1,1. With 6 missiles, Gripen C can cruise at Mach 1,1, Gripen E at Mach 1,3, Rafale C at Mach 1,4, Typhoon at Mach 1,5. F-22 with 8 missiles can cruise at Mach 1,7. Tornado F3 is also capable of supercruise. As it can be seen, supercruise is nothing new or special. But just the ability to fly at supersonic speed without afterburner is not enough if it does not give an operational advantage. Two to one advantage in cruise (or maximum) speed is of no use if it only lasts for half a minute. Therefore a fighter aircraft has to be able to achieve a supersonic flight for a useful period of time with standard air-to-air load, regardless of wether it is done with or without the afterburner (even though many take form over the function and state that supersonic flight without reheat is automatically supercruise). Necessary supersonic cruise performance has been defined here as 20+ minutes of supersonic patrol after a 200+ mile (322+ km) subsonic leg to the enemy territory. This should also include combat. Efficient supersonic flight at high altitude (above 50.000 feet) requires engines to be in a low afterburner. Fuel fraction required for effective supercruise is over 40 per cent. Supercruise capability is important in several aspects of air to air combat. First is the fact that fighters cruise at their maximum cruise speed when in the combat zone. Higher cruise speed allows pilot to surprise the enemy by approaching him from the rear, zone of poorest detection, and to avoid getting surprised by a slower-cruising opponent. It also allows the fighter to choose a time and place of engagement. In the beyond visual range combat, supercruise capability increases range of the missile shot, and reduces the effective range of adversary’s missiles. If pilot decides to pursue a merge or a visual-range attack pass, its excess kinetic energy again allows it to dictate terms of the engagement. It can also offset a possible situational awareness disadvantage – knowing where the enemy is is of little use if you can’t engage him. In fact, it could be easily possible that supercruise, not radar stealth, is the main advantage of the F-22 over the US legacy fighters – chase fighters were not able to keep up with the F-22, and modest 20 degree heading changes caused teen fighters to abort intercepts, having exhausted fuel supply. F-22s maximum supercruise speed is greater than Mach 1,4, most likely between Mach 1,5 and 1,7. While F-22 isn’t any more stealthy than the F-117, its higher cruise speed compresses the enemy’s OODA loop. At 30.000 feet, range for the F-22 is 0,02 nautic miles per lb of fuel at Mach 1,5 (1.636,5 kph; 589 kts), and 0,066 nautic miles per lb at Mach 0,9. 20 minutes of supercruise equals 196 nautic miles covered for expenditure of 9.817 lbs of fuel, and two minutes of afterburning combat uses up 1.377 lbs of fuel, leaving 6.806 lbs of fuel. This allows the F-22 a combat radius of 224 nautic miles or 415 kilometers. Realistically, radius will be less than that as this calculation does not account for takeoff, landing, or climb, leading to borderline useful supercruise performance. 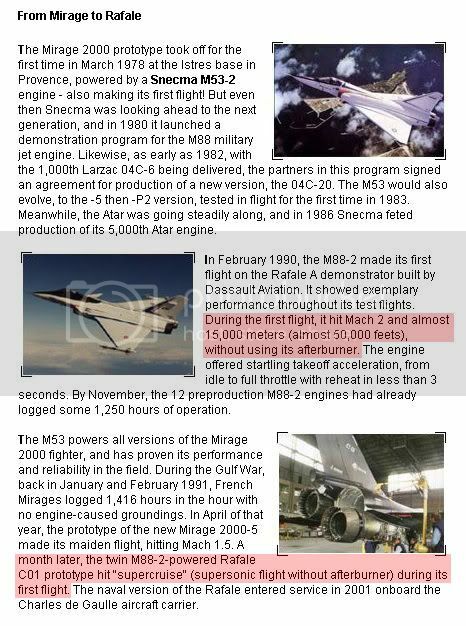 Rafale’s maximum supercruise speed is Mach 1,4 with 6 missiles. Fuel consumption is 2.250 l or 1.800 kg per hour at Mach 0,9 (987 kph at 30.000 feet). At full dry thrust, fuel consumption is 8.000 kg per hour, and 26.250 kg/h at maximum afterburner. Thus, 2 minutes of combat uses up 875 kg of fuel, while 20 minutes of supercruise use up 2.667 kg of fuel, leaving 1.178 kg of fuel. This allows for a flight time of 39 minutes at cruise thrust, allowing a combat radius of 320 km. Again, the calculation does not account for takeoff, landing or climb, meaning that Rafale will have to refuel in the air after the takeoff or carry a centerline fuel tank to have useful supercruise performance. As it can be seen, it can only maintain supersonic flight at low afterburner settings, which would be around 30.000 lbf or 13.608 kgf. At SFC of 2 kg/kgf h (real value is far higher as the cited value is for the most efficient – maximum – afterburner setting), it will be consuming 27.216 kg per hour, or 9.072 kg in 20 minutes. Two minutes of combat will use up 1.300 kg of fuel. Since F-35C has fuel capacity of 8.860 kg, and both other variants have less than that, it means that unlike the Rafale and the F-22, F-35 cannot achieve even the barest minimum requirement to be defined as a supercruising aircraft. Its cruise speed at maximum dry thrust is Mach 0,95. F-/15 is actually in similar situation – a clean F-15 at Mach 1,3 would maintain supersonic speed for several minutes in dry thrust. The F-18 transonic region ends at M 1,21, F-16 M 1,15, Rafale M 1,08, Typhoon M 1,05. Ergo, Gripen C flying at M 1,1 will be either just outside or very close to leaving the transonic region. F-35 is supposed to supercruise for 150 miles at Mach 1,2. At 40.000 ft, turbojet would have its fuel consumption reduced to 1/3. This reduction will be far less for a turbofan, especially one with comparatively high bypass ratio such as F135. Still, assuming such reduction, F-35 would consume 3.696 kg/h. F-22 has a requirement for 20 minute supercruise, during which it consumes 55% of its internal fuel. For 150 miles at Mach 1,2, F-35 would need 11,4 minutes, for fuel consumption of 700 kg. Even assuming 1.400 kg of fuel consumed for supercruise, that is still only 17% of F-35’s internal fuel. In other words, F-35 might be able to achieve supersonic speed without afterburner, but that cannot be compared to supercruise capability of F-22, Typhoon, Rafale or even Gripen, because it can do it only with such a limited fuel load that it is useless in practice. This entry was posted on July 5, 2014 at 7:12 am	and is filed under Uncategorized. Tagged: definition, history, supercruise, supersonic cruise. You can follow any responses to this entry through the RSS 2.0 feed. You can leave a response, or trackback from your own site. The other advantage of Supercruise is to close the distance gap quickly and force the combat to with in visual range. Agreed. If you combine supercruise and jamming, opposing fighters might be within visual range before they even manage to lock on to each another. AFAIK, such thing happened when Gripens faced Eurofighters in an exercise. I don’t think that in a sense, there are very many true supercruisers. Hmm … maybe Su-27 variants with their high fuel fraction could. Perhaps also the Mig-31. Among the dedicated fighters, your FLX designs maybe one of the first, were it to be built. Technically the YF-16 had it been kept in its original form might have accomplished it, especially with a newer engine. Yes, FLX always had a supercruise requirement, that was one of reasons for high fuel fraction and relatively austere design. @picard578: The datas i have, for years, about the Rafale’s supercruise are M1,4 + 6 MICAs + 1 belly tank (1250 liters). That should improve the combat radius. How can you be so precise? I have no doubt about your method and integrity, but i can’t imagine LM giving such informations?! Lockheed Martin claimed that the F-35 can supercruise for 150 miles, yet other info makes it clear that the F-35 cannot supercruise (according to standard definition) at all. It was not hard to put two and two together. As for Rafale, I couldn’t find any info. 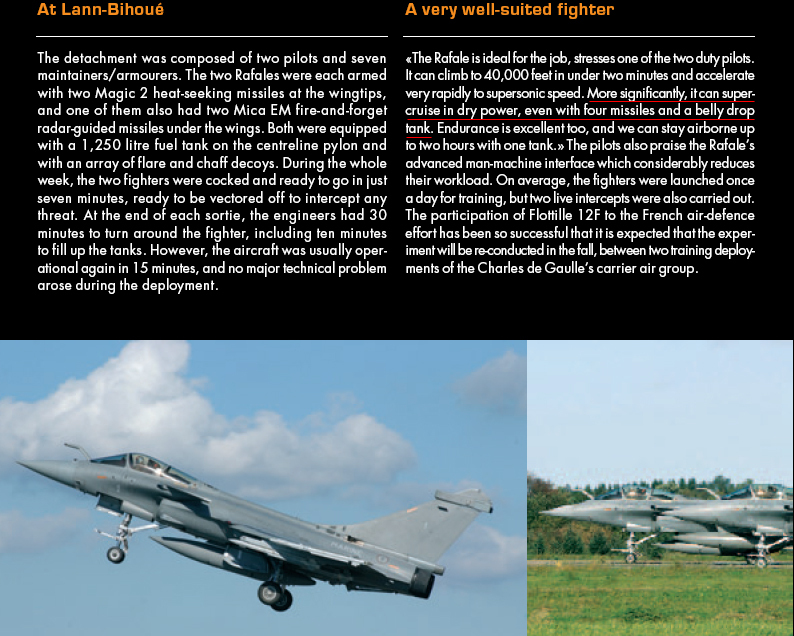 IIRC, Rafale was supposed to supercruise at Mach 1,4 with 6 missiles, increased to Mach 1,6 with higher-thrust engines. 1/ Lm say: The F-35 can supercruise for 150 miles. 2/ It is said, it can’t. 3/Your conclusion: The F-35 (at military power), needs 150 miles to decelerate from M1,6 to subsonic. I didn’t want to accuse LM of outright lying, and I do know how corporate propaganda works (“F-22/F-35 are invisible” – nope, they aren’t, they are only hard to detect with radar). The only way the current crop of fighters have a realistic ability to get supercruise would be to refuel inflight them shortly before entering contested airspace. Of course, this adds more complexity. You’d have to run a fleet of refueling tanks and keep them well guarded. That means fewer fighters for the front lines. You could also do this with an FLX type of fighter, refuel shortly before entering hostile airspace. The advantage here is that the FLX is much cheaper, so you can have more aircraft. Of course, even with air superiority, it may very well end up being not so much destroying the opponent through attrition and taking on their top 5-10% of pilots as much as it is outlasting the opponent. That means having more numbers yes, but also fuel, ammo, and spare parts. There have been cases of air forces grounded due to the shortages in those 3. And of course, there’s the matter of actually taking advantage of the air superiority. The US so far has used mostly bombing and drone strikes with air superiority. Not exactly making the most of the situation. Drones I think will prove immensely vulnerable to a nation state conflict. Even those large radar guided SAMs probably could get a decent kill ratio since they’re pretty much not able to get complex maneuverability in current model drones. That may change with time, but with better technology may also come better IR missiles. Or to use external fuel tanks, though calculation I did recently on a forum suggested that Gripen NG might have useful supersonic endurance even on the internal fuel. Rafale should also have it, but not at its maximum supercruise speed. Yeah, USAF never realized that its main mission is supporting the Army. Downside to that is that you get fewer missiles. There are modest gains to range though (drop tanks add drag, that’s the issue). Not so much they did not realize as much as it is willful ignorance. They do not want to appreciate the truth – that air power has limits. Precisely. I think it actually has to do with inter-service rivalry and prestige – if USAF were to admit that their main mission is supporting the Army, they would have to give up many wasteful projects, such as the F-35 and the Next Generation Bomber. And these are just the ones that got caught. I’d say that part of it is due to the “up-or-out” policy, part of it due to a connection between military and contractors, part due to too top-heavy military and part due to the military itself being too large. And these parts seem to reinforce each another. I do not know what you thought about the Air Force General getting drunk in Russia and staying drunk full time through the conferences and night life over there after but it sent waves thought the establishment. What image would the Russians have developed of him as well as the service. Ditto for the admiral stealing gambling chips as well as the Army Generals affairs with women, etc. It is just one scandal after another. And that is us here. Can you imagine the abuses going on with the Indians and Chinese???? The thing is, the US DoD is never going to address the underlying causes of all of this corruption, the closeness with defense contractors, the wasteful spending, and the other problems. They want to keep the money flowing. Yeah, I know. Sweden took a good approach with Gripen – SAAB actually had to deliver a good aircraft or they would have bought a foreign design to replace Viggens (F-16, I think). I think it’s a reflection of the true intentions of the F-35, as a bomber. At this point’ I’d be surprised to see a single US weapon that does not come at well over the budget. As for the new US bomber, it will be a repeat of the B-2 fiasco. I’d be surprised if they maange to get 25 of these at less than 800 million USD unit flyaway. Officially, they have just today submitted the request for bombers just today. The real question will be how much will this bomber and the nuclear submarine really cost? The nuclear submarine too deserves a look. It’s a big 20,000 ton submarine and there does seem to be a lot of cost inflation. Suffice to say, no US program ever costs as advertised nowadays. Chris, the bomber has not been developed in secret. It has been known and reported in the press. They are at a stage where they where seeing vendors and trying to make up their mind about what capabilities they wanted and which ones they could live with out. This is a very low cost stage in the development. The use of mature technologies is intended to make the cost predictable. It also speak reams about modern bombers role in war fighting that they do not require any new technology or at least no new risky technologies. The key question is if any of these bombers either present or future would be able to penetrate contested air space and if not will they be relegated to the role of being bomb-trucks letting their loads off from stand-off range. Just now the ones in inventory are being fitted with pods to locate ground targets just like strike aircrafts. There has also been some discussions about the F-35 penetrating the air-space and them locating targets for the bombers who would be stationed safely out of harm. But they must have something to fly once the current fleet ages itself into obsolescence. Given the state of accounting at the DoD, it has become very difficult to “follow the money” so to speak. We have not yet even seen the final specs, so I am not so confident that it is only “mature” technologies at work here (and I bet the defense industry will mess that up somehow). A better question I think is, are strategic bombers even needed at all? I’d say no. It’d be better to build a fleet of smaller attack aircraft, something like what Picard had in mind. The smaller attack air crafts do not have the range or payload specially for the larger bombs. Even today the most capable maritime surveillance and strike aircraft is the B-1 who alone could patrol across the Pacific Ocean and has proven that it can field weapons capable of striking fast ships… this is remarkable. Having a capability is useless if capability by itself is useless. What can be done by the B-2 that can’ be done by the B-52 and B-1? Not much. How many things can B-52 and B-1 do that are actually useful? Even less. The fuel comsumption quote for the Rafale is at 0 altitude and speed. At hight altitude the fuel comsumption is much lower leading to a far greater radius for the rafale. Ya, but that is true for all fighters, and I have no reliable data to calculate precise variances. Interesting post. However, could you specify the source stating that Rafale can supercruise? As far as i know, Typhoon is the closest fighter that can get anywhere near the F-22 supercruise capability. And just look at Rafale engine numbers, its hard to think it can achieve such feat. Yes, Rafale can supercruise. Even Gripen C can, in fact. Supercruise is a result of having high thrust-to-drag ratio, which itself is achieved through combination of low drag, high thrust-to-weight ratio and low wing loading. I also have sources about Mach 1,4 written down somewhere, but it’s late so I’m not going to search for it since that wasn’t your question. doesn’t seem accurate at all! “The F-35, while not technically a “supercruising” aircraft, can maintain Mach 1.2 for a dash of 150 miles without using fuel-gulping afterburners. “Mach 1.2 is a good speed for you, according to the pilots,” O’Bryan said. So this official information clearly indicates that the F-35 is able to maintain a speed of Mach 1.2 for a dash of 150 miles without using afterburners which is definitely not what the author of this article indicates (decelerating from Mach 1.6 to subsonic during the 150 mile dash)! So yes, the F-35 does have a supercruise capability, limited true to a certain amount of time/distance but a supercruise capability nevertheless. Besides, the limited supercruise on the F-35 isn’t due to aerodynamics but due to the engine which isn’t prepared for supercuise (hence limited to something like 150 miles) which is certainly an indication how great this aircraft (F-35) really is – despite not being built to be supercruise capable, it does have the capability nevertheless! And please lets stop this F-35 “mediocre performer” “Bomb-hauler/truck” nonsense! The F-35 is an extremely capable air-to-air platform (juts like it is in air-to-ground) and for example it combines the great agility of the F-16 and F/A-18 in terms acceleration and turning capabilities respectively! Even if my interpretation is wrong, it does not make the F-35 a supercruising aircraft. Maybe you should read up on definition of “cruise”. Was supposed to, but does not. Piccard, hello. May you re-upload the quote from the USAF Flight Test Center at Edward Air Force Base? No, unfortunately it seems I either did not back it up or lost the backup somewhere along the way (had to do a clean installation of Windows a few times since then). Picard, can you check your figures on the F-22? Did you take into account change in speed of sound with altitude?